19.2k to & from school + tempo run with x-c team. 4 mile tempo in 7:42/8:03/7:57/7:40 with some of the JV girls on our slightly hilly course. Legs tired, so not such an easy run. 12.5k with easy 1000 x 6 all around 5:00. Just cruised because legs tired, 5k run tempo tomorrow and race on Sunday. 5k tempo run with JV girls. 23:23 - the pace seemed faster and the first mile WAS faster, but that's what the watch said, so I guess it was right. Anyway, it was a nice moderately hard effort. 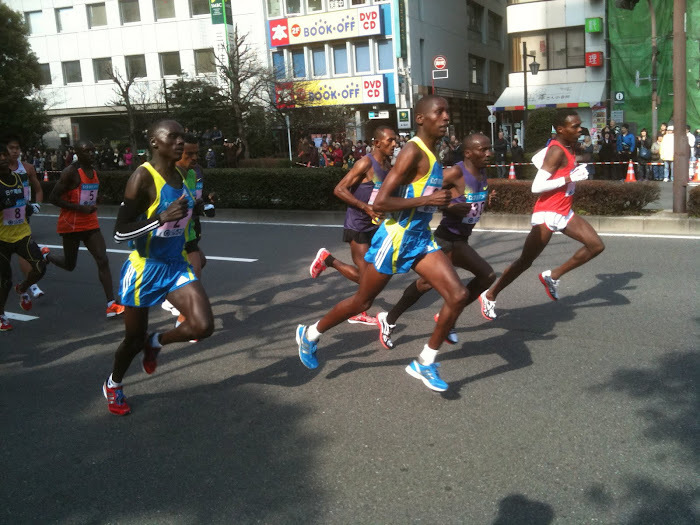 10K race in Nagareyama, Chiba pref. 39:58 which got me 4th in the 60s age group (out of 376). 193 overall out of 3,279 men. Surprisingly good result, as it was only 14 seconds slower than last year, when I was in better shape. Also because my last two 5k time trials on the track were 20:04 and 20:28, so didn't think I could run under 40:00. Also because it was raining fairly hard and there were lots of big puddles to splash through. I missed some splits, but I think the 5k splits were 19:54, 20:04. I felt good the whole way, although was constantly pushing to hold the pace. Followed a guy who I thought was in my age group (only one number in front, so couldn't see it) from 4k to 8k, then he pulled away (or I slowed). But I kept him within 10-15 meters and with 200m to go kicked a bit and caught up about halfway. So I decided to go for it and blasted the last 100m, which really surprised me. Caught and passed him, and then looked back to see his number and realized he was in the 50s. Was very happy with that kick anyway. I always run well at this race, will go next year and win the 70s age group. Next race is a half marathon on Nov. 19. Excellent performance in that 10k - congratulations! Super effort mate ... well done. Great result Bob. You've still got the competitive streak that's for sure. Well done Bob. Nice race and result. That time would have easily won the Melbourne 10k - 1st M60 was 41:04. Also would have placed you just outside the first 100. You're in good shape.